My name is Nathália, I’m Brazilian with Italian and Spanish origins, and I live in Spain since I was 18. I work with translations and cinematography, I’m in love with Climbing and Nature, and the world of dreamers and those who I call “flyers” intrigues me. I’ve started flying constantly and spontaneously when I was 17, and once I moved to Spain, all that stopped happening. Why? Looking for answers and using Internet, I realized that I wasn’t alone, and there was a huge community of flyers all around the World. Even courses to learn how to control projection! 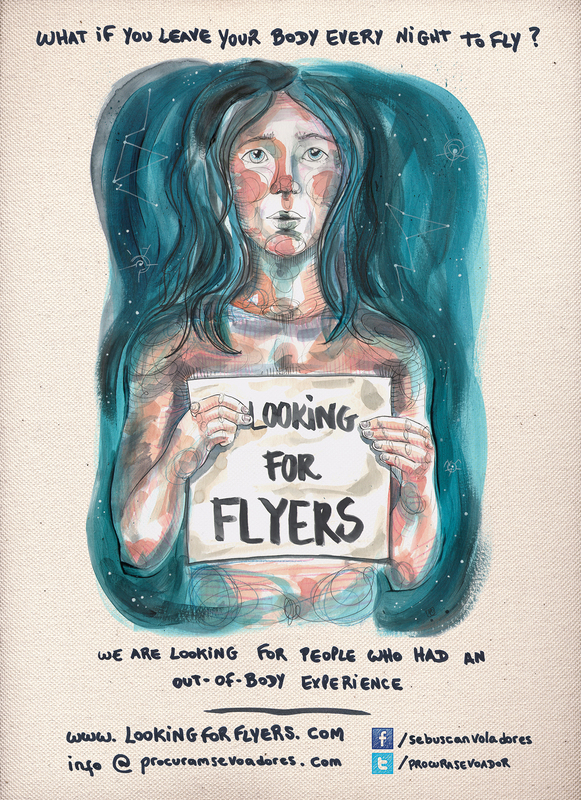 Because of my profession and my interest in this subject, I decided to go ahead with this project and record my search, interviewing flyers on my way and telling their stories. But what does it mean to be a “flyer”? Flyer is a concept that we decided to use referring to astral projectors, astral travelers or people who simply astral project, project their consciousness or have an out-of-body-experience (OBE) in a spontaneous or voluntary way. It’s not a technical or official term, it’s simply a sympathetic way to define these people without putting them first in a specific doctrine or philosophy, as we think that OBEs are a natural potential of all human beings and that’s how they should be treated, without dogmas and tabus!